ï»¿ Protest and March Against Columbus and White Supremacy! Protest and March Against Columbus and White Supremacy! Join us for our Anti-Columbus and Anti-White Supremacy protest, Saturday, October 12,2013 @11am, Placita Olvera st. 12pm March to Los Angeles Cathedral 1pm march back to Placita Olvera! 1-2pm Protest and Rally on Lawn of Placita Olvera. Signs will be provided by Mexica Movement. Bring water and sunscreen. Arrive early for parking and do your best to carpool! ***This will be a PEACEFUL protest. No bs tolerated. BOYCOTT THE AMERICAN LATINO MUSEUM! We are not Latinos! We are not Hispanics! This planned museum completely destroys our Indigenous identity and erases our presence. It is a complete act of genocide. Read the report for yourself and see the obvious cover-up. We are not Latinos! We are not Hispanics! Mexica Movement will be protesting and marching against Columbus Day on Saturday October 12, 2013 at 11 A.M. beginning with a rally at Placita Olvera. The march will start at 12 P.M. heading towards the Cathedral of Los Angeles to protest the church's active involvement in the genocidal and immoral actions of European colonialism. Next we will march to protest the criminal and immoral action of Christopher Columbus at the statue of Columbus located at the Los Angeles Civic Center Mall. The march will then return to Placita Olvera for protesting with our large signs at the junction of Alameda and Los Angeles Street with our protest signs facing Alameda. Mexica Movement is a Nican Tlaca (Indigenous) rights educational organization for all of our people of Cemanahuac (our lands of "North and South America" with no colonial borders). We focus on teaching the Pre-1492 history of our people. We educate our people on the genocidal and criminal history of Europeans on our continent. We clarify Nican Tlaca identity for our people: we are not Hispanic and we are not Latino. Nican Tlaca includes full-blood and mixed blood as one people. We are one people, with no borders, as one nation of Cemanahuac. 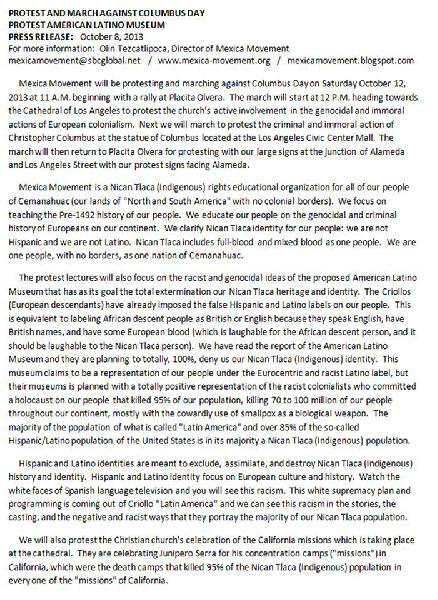 The protest lectures will also focus on the racist and genocidal ideas of the proposed American Latino Museum that has as its goal the total extermination our Nican Tlaca heritage and identity. The Criollos (European descendants) have already imposed the false Hispanic and Latino labels on our people. This is equivalent to labeling African descent people as British or English because they speak English, have British names, and have some European blood (which is laughable for the African descent person, and it should be laughable to the Nican Tlaca person). We have read the report of the American Latino Museum and they are planning to totally, 100%, deny us our Nican Tlaca (Indigenous) identity. This museum claims to be a representation of our people under the Eurocentric and racist Latino label, but their museums is planned with a totally positive representation of the racist colonialists who committed a holocaust on our people that killed 95% of our population, killing 70 to 100 million of our people throughout our continent, mostly with the cowardly use of smallpox as a biological weapon. The majority of the population of what is called "Latin America" and over 85% of the so-called Hispanic/Latino population of the United States is in its majority a Nican Tlaca (Indigenous) population. Hispanic and Latino identities are meant to exclude, assimilate, and destroy Nican Tlaca (Indigenous) history and identity. Hispanic and Latino identity focus on European culture and history. Watch the white faces of Spanish language television and you will see this racism. 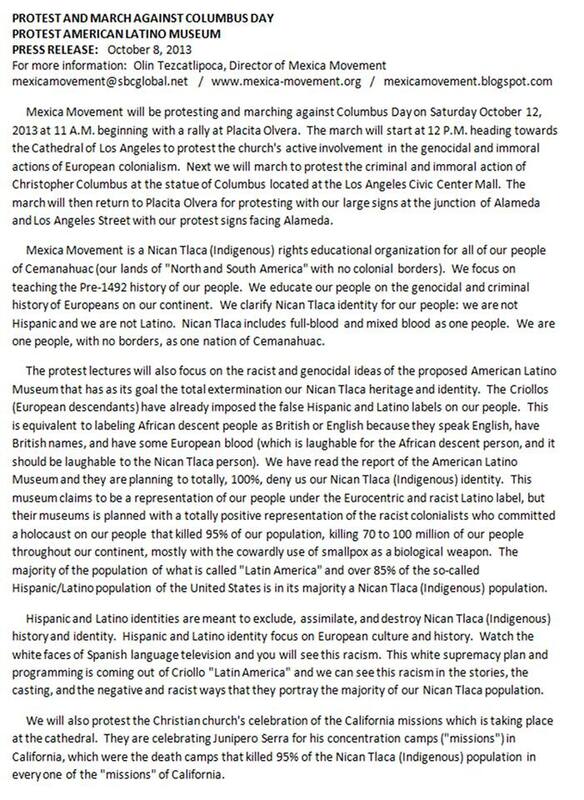 This white supremacy plan and programming is coming out of Criollo "Latin America" and we can see this racism in the stories, the casting, and the negative and racist ways that they portray the majority of our Nican Tlaca population. We will also protest the Christian church's celebration of the California missions which is taking place at the cathedral. They are celebrating Junipero Serra for his concentration camps ("missions") in California, which were the death camps that killed 95% of the Nican Tlaca (Indigenous) population in every one of the "missions" of California.